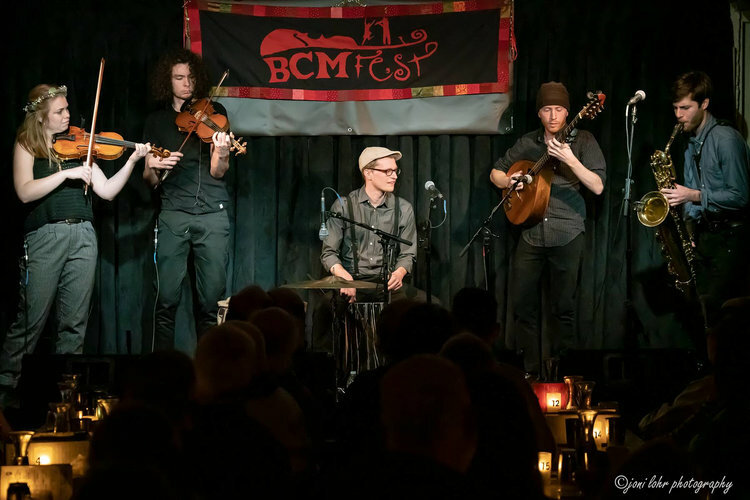 Rooted in original works spanning from the Celtic world, sextet Night Tree creates original music that borrows from the Swedish, Jewish and American folk tradition. Night Tree includes the dark resonance of the cello, baritone saxophone, and cajón meeting with the drones of accordion and intertwining with the soaring melodies of dueling fiddles. Contrast is created with the replacement of the baritone saxophone with the soprano saxophone, adding another fiddle-like melodic instrument to the mix. Drawing from an unusually diverse mix of musical backgrounds, Night Tree has discovered a sound both colorfully and resonantly different while delving into the realm of harmonies and rhythm that range from edgy to inviting, both unheard of and timeless. INÃ plays, interprets, and reinterprets music of the African-Diaspora specifically through the traditional musics of Cuba and Brazil. Through the use of just singers and drummers they engage their audience with vocal harmonies, dancing, and drumming. Having started in May of 2016, INÃ has already performed all around Boston at Club Passim, The Lilypad, Gallery 263, New England Conservatory's Brown Hall, CityPOP Egleston, The Museum of Fine Arts for Make Music Boston, Arts at the Armory, and Magnolia Loft presented by Journeys in Sound. Percussionist, arranger, and bandleader Julian Loida leads this Afro-Cuban and Brazilian collective as he collaborates with both masters of the tradition as well as students whose origins and exposure to this music vary. 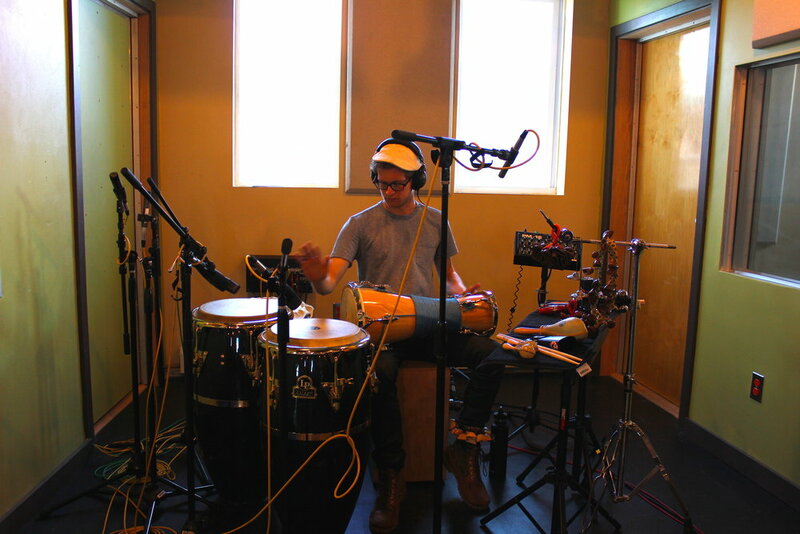 Percussionist and synesthete, Julian Loida, collaborates with virtuosos from the New England folk scene to form the New Acoustic collective: Fade Blue. Each collaborator is a featured instrumentalist/vocalist, composer, and stylist as they each bring their own cultivated personality and sensitivity to the soundscape. 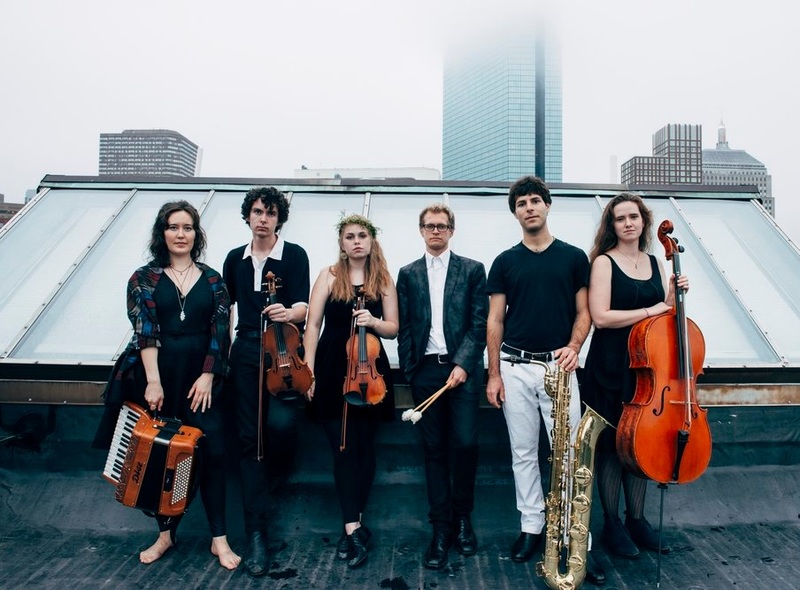 As all recent graduates of Boston’s prestigious New England Conservatory and Berklee College of Music, Zach Mayer, Lily Honigberg, Chris Overholser, Máiri Chaimbeul, Yaniv Yacoby, and Julian Loida create genre-bending music influenced by jazz, klezmer, Celtic, r&b, Afro-Cuban, classical, and avant-garde music. Mojubá is a modern world-jazz quintet that disseminates the folkloric music of Cuba and Brazil. This versatile quintet's mission is to not just perform but teaching about the culture from which their songs and arrangementsoriginate. By combining both sacred and secular songs with the rhythms of the Lucumi (Santeria) and the Candomble as inspiration for their compositions and improvisations, they unearth these traditions that are rarely heard in Boston. The quintet aims to inspire fresh ears to the communal qualities that this music possesses. Through its call-and-response formula and interlocking rhythms this music creates a social format that requires every person involvedto be equally important because the music is thoroughly intertwined. Each part and each instrument have equal worth in the making of this music. Mojubá has been awarded a grant by the New England Conservatory's Entrepreneurial Musicianship Departmentfor their project Bringing CUBA to the Community as well as a fellowship through the Community Performances & Partnerships program. Loida & Lenahan are a synthesizer and vibraphone duo based out of Boston. Julian and Kelly are both conservatory-trained classical musicians who found common ground in their synesthesia, where sound has form, color, and texture. For Loida & Lenahan, the way we see sound is integral into the way we hear sound, and we invite you to be an active listener in our sonic exploration of synesthesia. As they enter their 10th year as a still young St. Louis rock band, Project 324 plays a unique blend of classic rock, alternative, blues, jazz, and dance music all around St. Louis. 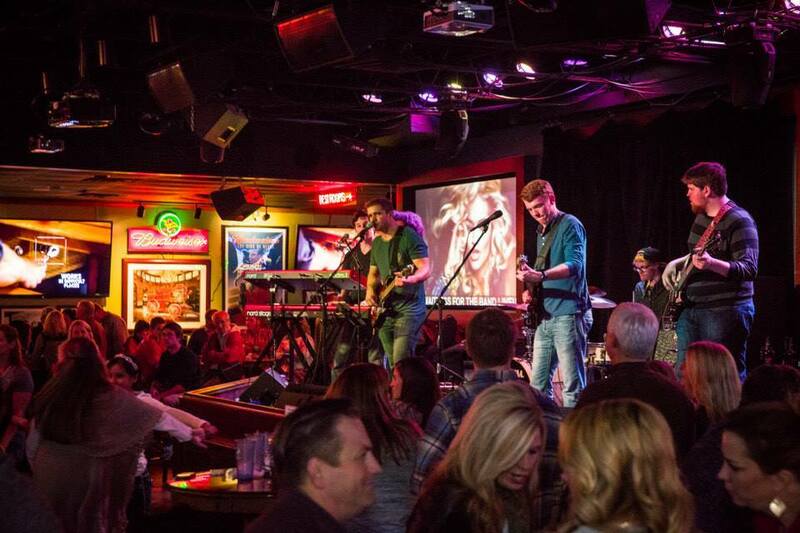 Project 324 has been featured several times by local news channels as a strong upcoming St. Louis rock band and in only their sophomore year as a band St. Louis' KSHE 95 called them, "The future of St. Louis Rock'n'Roll." After recording their EP at Red Pill Studios with Jacob Detering less than a year after forming in 2012, they have remained active in the St. Louis area. Members have gone on to open for Zac Brown Band and Gary Clarke Jr. as a part of the Nashville band The Muddy Magnolias -- pianist, Ian Miller. Bassist Sam Freund lives in New Orleans and tours with the band Stoop Kids who put on an high-energy show using an arsenal of genres from jazz to hip-hop to funk, blues, and Second Line. Vocalist Danny Sly in 2010 was awarded a full-scholarship to the Berklee Five-Week as the male vocalist in their select Rock Ensemble. While in this elite group Danny was able to work with guest artists such as John Mayer and more. Trio de Tambores performs a sacred style of drumming called batá from the Lucumi tradition in Cuba. Thethree drums play interlocking parts with different melodies for each rhythm, and accompany songs in praise of various deities called orishas. Orishas represent different aspects of nature and human virtues, much like the Greek pantheon. Their program includes rhythms and songs from both the main provinces of Cuba, Havana and Matanzas. Co-bandleaders Julian Loida and Kristin Olson started Trio de Tambores in 2014 to perform in the St. Louis area at The Tavern of Fine Arts as well as The Clayton Arts Fair. Supporting members included Andrew McAfee, Tommy Rorabeck, and Melinda Leoce.